SevenTorrents has decided to call it a day after having a long stint of 10 years in the torrent industry. The torrent index who announced its retirement has serviced more than 40 million unique users over the past 10 years, reports TorrentFreak. 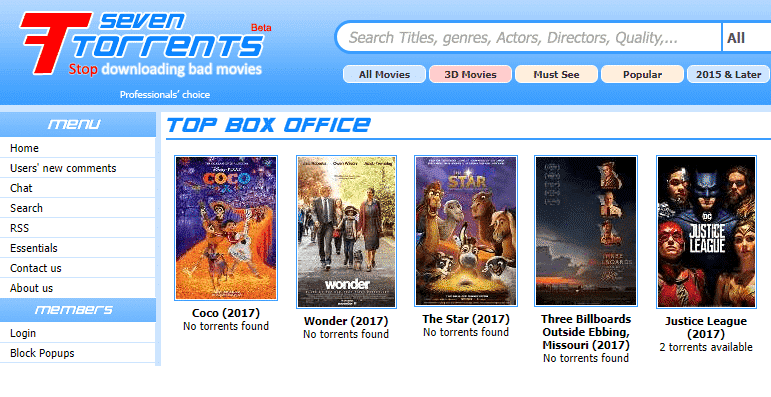 Looking for torrent sites to download free movies? checkout the link below for the best torrent sites. For those unaware, SevenTorrents has been serving torrents for around 10 years. Last year, it serviced around six million unique visitors and has around 200,000 members. Although SevenTorrents has decided to pull its curtains, it has transferred its user database to a brand-new torrent site, WatchSoMuch. We have been serving you for near 10 years and served over 40 Million visitors, with all troublems including copyright complaints, limitations, domain bans and …., we were able to keep this site up and running and make our visitors satisfied. Today we have decided to retire. But this is not the end for you and we will not let you down, there is a good news for you. We have talked with the owners of our professional friend site WatchSoMuch which is doing same thing as we were doing but in a better way, it has a super fast search and modern and mobile friendly design. We have transferred all the data and members to there, please visit and continue using your account in WatchSoMuch with same password and enjoy. SevenTorrents will be up for few days but we no longer update this site. We promise this event will look like a change of address and layout to you. there is no difference the data will be better and more complete, all data including movies, torrents, activities, comments have been transferred to WSM so you will feel like home. The transfer of SevenTorrents’ user database to WatchSoMuch (WSM) – a site that only surfaced in June – has raised privacy concerns for users as their data is being transferred to WatchSoMuch. When TorrentFreak contacted SevenTorrents highlighting the privacy concerns raised by users, the latter said that the users shouldn’t be worried. “[T]he announcement on Facebook you can see real people reactions, none of the comments in there nor the emails we received show any worries about their data, except people are sad, and asking us not to close this site,” SevenTorrents told TorrentFreak. “Yes, logically [users] should get nervous, but they [shouldn’t]. “Transferring the user data to a new site should sound like an upgrade to an existing site. It’s not publishing data or selling it, which many of current torrent sites do without any notice. “But we respect those users who don’t like to join a new site (if there are any) and I will ask new owners to add a delete account option if there isn’t any,” SevenTorrents added. Apparently, more than 6,000 former SevenTorrents users have switched and logged into WatchSoMuch over the past two days. what is the new addres of seven torrents site?